The Tillicum Foundation mission is to serve the Lower Columbia Pacific Region through commercial-free community radio programs and services that enrich life by illuminating the role of the arts, promoting cultural and educational growth, and bringing focus to current issues of local and regional public interest while providing a forum for diverse and underserved groups. The Tillicum Foundation owns and operates KMUN 91.9fm (Astoria), KTCB 89.5fm (Tillamook) and KCPB 90.9fm (Warrenton), known collectively as Coast Community Radio. We are the only non-commercial, local community radio stations serving the coastal areas of Northwest Oregon and Southwest Washington. The Foundation’s nine-member Board of Directors is non-paid and elected for two-year terms at the annual November membership meeting. The Tillicum Foundation is committed to using radio as an active resource for community development and public access. We seek to involve and establish cooperative efforts among community groups including seniors, women, young people, and ethnic and cultural minorities. 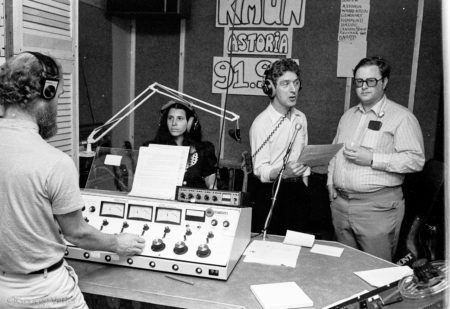 KMUN first signed on the air on April 17, 1983, from a small studio on the second floor of the Gunderson Building, on Commercial Street in the heart of downtown Astoria. The ground floor was occupied by Mode-O-Day fashions and the Beauty College. A few years later, KMUN was given its very own home by its fairy godmother, Helen Patti. After much hard work and construction, the former Trullinger House (which had a history of a bordello, an apartment house and a dental office) was turned into broadcasting studios and offices. KMUN began operating from the newly named Tillicum House (Tillicum means “people”, or “friend” in Chinook), just above the edge of downtown Astoria, in 1987. It is a lovely Queen Anne Victorian with views of Astoria and the river from the air room and lobby. KMUN broadcasts 5,000 watts of power at 91.9 MHz from its main transmitter on Megler Mountain (straight up the hill from the Washington side of the Astoria-Megler Bridge), 10 watts at 89.5 MHz from translators located in Cannon Beach and 104.3 MHz in Wheeler, and 10 watts at 91.3 MHz from a translator serving South Astoria. KTCB came on the air in 2005 and broadcasts 400 watts of power at 89.5 MHz from Cape Mears, serving Tillamook County. Plans are currently underway to provide local news content for the community. For many years the Foundation was asked by a large segment of the community to provide more national news and classical music programming. Finally, in 2003, the Federal Communications Commission allowed broadcasters to apply for a small number of permits for the construction of new transmitting facilities. Financial support from the community and a small business loan brought KCPB to air on KMUN’s 23rd birthday, April 17, 2006. On January 17, 2007, the Foundation was granted full license for the operation of KCPB. Then with the support of members in July of 2010, that initial build was greatly extended to reach more of the Coast and inland areas as well.